It’s not an overstatement to say that the #1 problem facing the state of Oklahoma is the use and abuse of alcohol and other drugs. Many Oklahomans have personally felt the impact of substance abuse or addiction in their own lives or in the life of a friend or family member. FATE seeks to educate Oklahomans about substance abuse and addiction and to motivate them to action in solving both the individual and the statewide problem. Oklahoma Life of an Athlete (OKLOA) is a FREE program offered to Oklahoma schools through the Whitten-Newman Foundation and F.A.T.E. (Fighting Addiction Through Education). OKLOA includes both dynamic, interactive online training for athletes about the impact of alcohol and other drugs on athletic performance, as well as live presentations and assistance on re-writing athletic codes, developing student leadership, and promoting coaching effectiveness and community support. OKLOA has been endorsed by The Oklahoma Athletic Trainers Association, The Oklahoma Coaches Association, The Oklahoma Secondary Schools Association, The Fellowship of Christian Athletes, The Jim Thorpe Association and the Oklahoma Department of Mental Health and Substance Abuse Services. "We encourage all individuals within Oklahoma schools, to seriously consider implementing this program at their school. The ready availability of such a great resource, at no cost to a school, provides the tools necessary to proactively influence student athletes and others." "The Life of an Athlete program is an incredible resource and I encourage all universities and schools throughout the state to take advantage of this wonderful gift." "I would highly recommend every coach, athletic director, principal, superintendent and school board seriously consider implementing Oklahoma Life of An Athlete into their programs. I believe OKLOA can make a significant positive difference in the lives of athletes and in schools across the state." "OKLOA is not a "pledge sheet" or a "poster" campaign against the use of teen-age alcohol and drug abuse. OKLOA is a comprehensive educational program that speaks to athletes, coaches, parents and patrons in regard to the far reaching effects of use of drugs and alcohol on an athletes’ performance, and the life style changes that occur as a result of chronic use of alcohol and drugs. 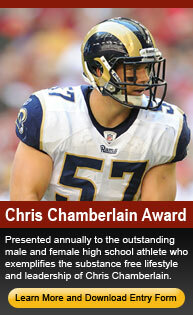 I would recommend to all of our 481 member schools of the OSSAA that they review this program." 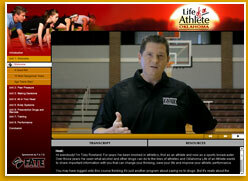 Oklahoma Life of an Athlete (OKLOA) is a program based on the Life of an Athlete program developed by John Underwood, President and Founder of The American Athletic Institute (AAI). Mr. Underwood is a former NCAA-All American distance runner and World Masters Champion. An athlete all his life, John has been an Olympic level coach, trainer of Navy Seals, teacher, scientist, and crusader for drug-free sports. Chamberlain Award winners receive their trophies! FATE and Oklahoma High School Sports Express. This is one of our greatest opportunities here at FATE to encourage high school athletes to educate themselves about the dangers of substance abuse and to motivate them to make a difference in their school. Can't wait for next year's challenge!! Making a difference one step at a time. For more details about any of the events listed below, or if you would like to request a presentation by FATE at your school, please contact jim@changeyourfate.org. View the list of schools that have already participated in the OKLOA program.